Finding a policy framework within which to reconcile social welfare objectives with market economies has been a major concern of both social commentators and politicians throughout the nineteenth and twentieth centuries. Whilst this quest may be perennial, neither the problems nor the solutions remain fixed, either across time or between different countries. In this final session we are going to consider how, and to what extent, Britain has attempted to meet its social welfare objectives. Does Blair's Britain face the same challenges as the Victorians? Or, do the social policy interventions of the past appear to be outmoded solutions to outdated problems? It is widely suggested that something happened during the nineteenth and early twentieth centuries which fundamentally changed the way in which people both analysed and responded to social problems. Industrialisation and its correlate urbanisation were associated with a realignment of relations between the individual, the household, the community, the market and the state. Those who migrated from the country to the towns in search of employment left behind their previous social and economic linkages with kith and kin in the rural economy. The working classes found themselves in a congested and churning urban environment struggling to accommodate each new wave of economic migrants, and keep pace with rising expectations of the lifestyles and living standards which it was hoped technological change and economic growth would bring. During the nineteenth century the Victorians puzzled over how to deal with problems of pauperism and poverty, public health, housing, and education; all issues which became increasingly identified as aspects of what was referred to collectively as the 'social question'. The dominant laissez-faire ideology suggested that unfettered market activity would ensure the welfare of all by providing the conditions for each individual to maximise their own individual well-being. The persistence, and even deterioration, of the living conditions of the urban working classes in a climate of rising wealth therefore baffled contemporaries. Either there was something wrong with the working classes which prevented them seizing the opportunities presented to them, or, there was something wrong with their analysis and understanding of the operations and outcomes of a market economy. Whichever viewpoint they adhered to, the Victorians increasingly came to recognise that some sort of collective response was required. In session one we saw that society gained an increasingly nuanced awareness of the nature of social problems and the interrelationship between them. At the heart of this awareness, however, lay a dispute about the cause of these problems; over the course of the nineteenth and into the twentieth century, the balance of opinion shifted from a focus on the individual to more structural determinants of social problems. The dependence of the urban working classes on wage labour made them subject to the vagaries of the economic cycle. In periods of economic downturn large numbers of the labour force may have been laid off, through no fault of their own. The economic inactivity of large groups of the population, whether due to unemployment, sickness, or age, placed demands on individuals and households, which they were ill-equipped to meet alone. Some of the more affluent members of the working classes sought a solution within the collective arrangements of the cooperative and friendly society movements. An alternative line of collective defence and welfare came from the proliferation of voluntary and charitable organisations which many see as characterising the Victorian solution to social problems. LSE/The Graphic Toynbee Hall was one of a number of philanthropic initiatives in the 1880s and 1890s that were designed to reduce the social gap between the rich and the poor, particularly in this part of London. There had been tremendous concern about social distress, and also about the political motivation of the working classes in London, in the 1880s. Toynbee Hall was an ambitious enterprise, set up by Canon Samuel Barnett who wanted to create a centre where upper and middle class students from Oxford and Cambridge could come to the East End of London, and live among East Enders, with the purpose of educating, befriending and to some extend proselytising to the local poor. Periods of economic depression and potential social unrest could precipitate a flurry of voluntary activity. Following the slump of 1866, a Mansion House Relief Fund was established in the City of London, accompanied by the opening of soup kitchens to provide unemployed labourers with food whilst coal and blankets were distributed to keep their families warm. Even this, however, was not enough to stop bread riots in the East End and an invasion of Hyde Park. Wealthy and well-known aristocratic philanthropists, such as Lord Shaftesbury, were associated with many voluntary organisations, such as Ragged Schools in the field of education and the Society for Improving the Condition of the Labouring Classes in the case of housing. 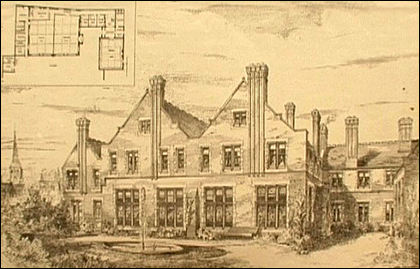 In other parts of the country, industrialists and manufacturers such as the Lever Brothers, the Cadbury's and the Rowntrees, experimented in building communities for their employees at Port Sunlight, Bournville and Earswick respectively. Help for the poor, however, did not only come from the upper classes. Some groups of workers established formal collective institutions such as friendly societies to provide benefits for members in times of hardship; others adopted the more informal approach of a whip round in the pub, or the offer of a Sunday meal to a neighbour in need. 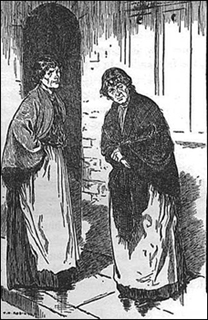 Illustrations and representations of pauper life in the East End of London were commonly found in periodicals. Voluntary organisations not only provided services for those in need they also facilitated the social, economic and political advancement of the rapidly expanding urban middle classes. Meeting the needs of the poor was not necessarily the only objective being pursued. In fact, from the 1860s some Victorians became concerned that voluntary activity was not helping, but harming, the working classes. This line of criticism came from the Charity Organisation Society (COS), which argued that the indiscriminate granting of alms and other forms of relief was pauperising the working classes by deterring them from seeking economic independence through work. The COS thus argued that each potentially needy case should be carefully scrutinised to assess the cause and extent of its need and only assisted if found to be deserving. They argued that voluntary activity should provide a vehicle for interaction between the poor and more affluent who were becoming increasingly remote in both their lifestyles and living conditions. The COS was not alone in adopting a moralising tone towards the poor, and some religious organisations used the offer of food or alms as a way to enforce attendance at prayer, a prerequisite for moral and social rehabilitation. Voluntary organisations, therefore, had a tendency to be particular in their choice of beneficiaries. In addition, their provision was geographically patchy, and insufficient in its financial capacity in the face of widespread economic depression. What do you think were the drawbacks to the Victorian voluntary initiatives? In the absence of other assistance, the Poor Law and its institutional embodiment the workhouse offered the last resort for the economically inactive unable to meet their own welfare needs. In a sense Poor Law provision was both collective and universal in that it was financed through local taxation and available to all in need within the parish, yet this was not equivalent to the comprehensive provision of social insurance and well-being, which the post-war welfare state developed. However, the Poor Law stigmatised those in receipt of relief; until 1918 paupers forfeited their rights to vote in an increasingly enfranchised electoral democracy. As education spread and the working classes became more politicised, they sought a less residual and more secure safety net to catch them if they fell prey to the economic, physical or environmental risks associated with engagement in an urban industrial society. By using their newly won political rights, the working classes could vote for increased state activity in response to social problems, such as illiteracy, ill-health or poverty, problems which could all act as barriers to the ability of some to exercise their civil and political rights. From the perspective of the more affluent classes, social welfare provision could also be seen to secure social cohesion and promote economic growth. The state thus took an increasingly active and interventionist role in the mixed economy of welfare. The state moved beyond the identification and regulation of social problems towards the subsidy and even direct provision of responses to them. This process of collectivisation is commonly seen to have culminated in Britain in the Beveridge Report of 1942, which following the Labour electoral victory led to the establishment of the post-1945 welfare state. If we pause to reflect, however, on the primary challenges to which this welfare state was designed to respond, we can see a remarkable continuity with many of the social problems which the Victorians had started to identify. Beveridge argued that the welfare state should slay the giant social evils of want, disease, squalor, ignorance and idleness. What was different, however, was the emphasis on the role and responsibility of the state in responding to these problems. The state legislated to provide: a comprehensive system of national insurance; a National Health Service free to all at the point of delivery; the mass provision of public housing; free education to the age of 15, subsequently raised to 16; and also took a more active role in labour market management. Despite high hopes that the welfare state would provide for all from the 'cradle to the grave', its advent did not spell the end of either social problems or the practice and development of alternative solutions. By the 1960s and 1970s it was quite clear that, although living standards had risen, social problems remained. This was due to both the unequal distribution of the benefits of welfare provision and economic growth and to the recognition that these benefits had themselves generated other problems. In fact the activities of both the informal and voluntary sectors can be seen to have played a key role in identifying the shortcomings of both the practice and the outcomes of the welfare state. The household continued to be a primary source of welfare provision offering education, socialisation, healthcare, and economic support for those not in work. A newly emergent feminist critique argued that the welfare state thus perpetuated and enshrined gender inequality as women were either trapped in the home or steered into low paid service provision within the state system. In fact, the post-war welfare settlement was premised on the assumption that women would remain at home, whilst the household was economically provided for by their husbands. As the social and economic context changed and women increasingly went out to work, they were no longer automatically available to provide care. In addition, as paid employees they were capable of contributing to social insurance schemes in their own right, in contrast to their position as unpaid domestic workers. As well as women, ethnic minorities were also starting to be identified as being comparatively disadvantaged by the welfare state. In the 1970s criticism and concern about the welfare state broadened to challenge the capacity of public welfare systems to enhance even general social welfare across society, rather than just the position of particular groups. The oil price rise and resultant inflation led to a slowdown in economic growth and a rise in unemployment, whilst the proportion of revenue taken in taxation became an increasingly important issue for the market, and the state faced difficulties in funding its social welfare expenditure. Not only were shocks being felt in the social and economic environment, ideological challenges were shaking the previously dominant orthodoxy that welfare expenditure was functional and beneficial for a thriving industrial economy. Economists and idealists of the New Right argued that, far from supporting the smooth functioning of advanced market economies, government tax and spend policies actually slowed down economic growth. This was due to both the inefficiency of the public sector and the capacity of welfare provision, particularly in the form of cash benefits, to act as a disincentive to work, thus creating a culture of dependency amongst the working classes. In addition, they argued that far from acting as a benign system of administration, public bureaucrats had a tendency to pursue policies which feathered their own nests by maintaining and increasing their budgetary power rather than acting simply in the public interest. Meanwhile criticisms started to come from both the political left and right that large-scale centralised welfare provision was unresponsive and ineffective in meeting local needs. During the 1980s and 1990s the political dominance of the Conservative Party is associated with the rhetoric of attempts to 'roll back the frontiers of the state' to free up the economy and encourage entrepreneurship, economic dynamism and therefore growth. Although total social expenditure did not really fall as a proportion of national income--and even rose during the 1980s recession--changes were made to institutional provision, modes of intervention and entitlements to benefits and services. The role of the national and local state in welfare provision was not automatically assumed to involve welfare provision, but rather the focus started to shift back towards how the state could regulate and possibly subsidise provision by others. Whilst nationalised industries were privatised, a whole range of state welfare services, particularly those delivered at the local level such as housing, community care for the elderly and others, as well as support services such as street cleaning or school meals provision were subject to contractual tender. This shift from the role of local authorities from providers to enablers has been associated with large-scale growth in the voluntary sector as organisations increasingly provide services under contract to the public sector. Where state provision remains, increased monitoring and performance targets have sought to raise standards and hence effectiveness. With the advent of the New Labour Government many of these trends have continued and partnerships with both the voluntary and the private sectors are being sought in an increasing range of welfare services. Do you think social policy in Britain today is closer to the Victorian or the mid-century welfare state model? Why? Some might argue that social policy in Britain today shares more similarities with that of the Victorians than the more universalist post-1945 welfare state; given the increasing focus on the role of the voluntary and private sectors within the economy of welfare, the targeting of benefits and the emphasis on the responsibility of the individual to work. However, such an analysis would neglect the fact that the role of the state in both providing and regulating relations within this mix is vastly different. Unlike either the Victorians or the Conservative government before them, however, New Labour has pledged to reduce inequalities within the society by increasing redistribution. Whilst this is a traditional old Labour pledge, the policy emphasis is less on public provision and benefits and more on analysing how this can be achieved through the tax rather than the benefits systems, in keeping with the electorate's apparently irreconcilable demands for lower taxes and increased social expenditure. As well as demonstrating continuities with the past in terms of the methods of policy intervention, we may also note the familiarity of the social issues of education, child poverty, pensioner poverty and healthcare which again dominate the policy agenda. The repeated recurrence of these issues, however, does not signify that social policy has failed. Whilst living standards have risen, so too have the electorates expectations of public service, in the case of health partly due to technological advances making an ever increasing range of healthcare services possible. The perceived social needs of society have also risen due to demographic change in that the fall in the birth rate and the rise in mortality--itself arguably a social policy triumph--have increased the numbers of people who are economically inactive and dependent on welfare benefits and services. In addition, social policy has also become more localised in its focus. During the 1990s concern grew about the multiple deprivation of the so- called 'socially excluded' who it was argued were concentrated in low quality public housing in areas with low educational attainment, low health status and high unemployment. The New Labour Government has responded to this issue by arguing that government should become more 'joined-up' and has established the 'social exclusion unit' which crosscuts the more traditional functionally specialised government departments. The search for a policy framework within which to reconcile market economies and social welfare objectives thus continues. Whilst the main ideological and administrative social policy arguments of the past three decades have raged about whether and how it was possible to combine an active programme of state welfare expenditure with economic growth, a new branch of social policy started to challenge whether this apparent elixir was even desirable. From a Green perspective the environmental costs associated with the pursuit of economic growth and the debasement of local and community economies and welfare arrangements, were all associated with the existing arrangements. In addition, in a global context some analysts argued that the growth of the more economically developed Northern nations was partially premised upon the exploitation of workers in the less developed South. Whilst these developing economies struggled to gain access on more preferential terms of trade within the global market place, nations with more developed welfare systems sought to restrict their access, regarding it as unfair competition as their production costs were kept low with the absence of social overheads. Thus debates about poverty and unequal distribution of resources and life chances take place on an increasingly international level. As economic relationships become more globalised in their nature, questions are being asked about the capacity of nation states to respond to social problems in a national scale. Thus we might ask how and whether in the future social problems and responses to them will be shaped on an increasingly global scale.